You have a great idea for a great membership site and you’re excited – that’s excellent! Now the hard work begins. One of the jobs you have ahead of you is marketing your membership site with the right angle. You need to make sure that you’re branding yourself and your site to reflect the type of value your members will get for their investment of a membership fee. People need to have a good reason for investing their hard earned money in your membership site, so let’s look at what it will take to create a marketing plan for your membership site. The first things you should look at are the benefits that your future members will reap from becoming a member. What will you be listing as the benefits of your membership site? Think of what you plan to offer. What’s different from all the other membership sites like it? Are you capitalizing on a new niche, or approaching a tried and true niche from a different angle. Think about what you plan to offer as specials for new members, too. Make it very clear that you’re offering benefits that potential members can’t afford to be without. When you’re branding yourself and your site, keep everything you’re offering related directly to that topic. If you’ve created a membership site around a health topic, make it clear that once someone joins that site, they’re going to be provided with expert information in every form available – all about that particular topic. While you’re creating your membership site, be sure that you’re providing value at every turn. This will help you market your site effectively. Content is valuable, but so is a forum where your members can talk to others (and you) about the focus of the site. This is valuable because it provides a sense of community, and that will keep people coming back and bring in new members, too. You’ll also want to brand your site as a reliable source for the best information. Part of how you’ll do that is through your promotional and advertising methods, which will most likely include articles and other content that you submit to directories and pay-per-click ads. When you’re marketing your membership site, remember that one very valuable key to getting new members is to make it clear that you are available to your members. This is customer service, and customer service is very important to anyone who is buying something, whether it’s a car or a bag of groceries or a membership to an exclusive site. The angle you have to take when marketing your membership website is one that is going to make it clearly outline what your site is providing and the fact that you, as an expert, are offering something that isn’t available elsewhere, or all in one place. Find out what your potential members want, then brand yourself and your site as the best place to find all those things, all in one place, all with the promise of great customer service! Should You Stick or Quit? 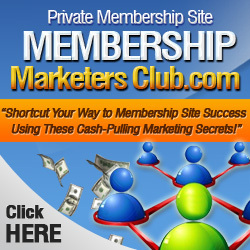 Can You REALLY Make Money With a Membership Site?